What did the Buddha give you besides the golden Kesa? Mahakashyapa said: Lower the flag’s mast in front of the door. Ananda obtained the great Satori. Ananda belonged to a warrior caste and was a cousin to Shakyamuni Buddha. “Ananda” means happiness or joy. He was born on the night of the Buddha’s great Satori and he was so handsome that everybody was happy when they saw him – therefore his name. Ananda was the first to understand, intellectually brilliant and strongly perceptive, he was the Buddha’s secretary during 20 years; he disseminated Buddha’s teachings and studied all his ways. When the Buddha transmitted the Treasure of the Eye of the True Law to Mahakashyapa, he also gave instructions to Ananda to help propagate the teachings. This way, during 20 years, Ananda went with Mahakashyapa and became intimate with the Treasure of the Eye of the True Law. This should justify the fact that the Way of Zen is not like other schools. Ananda was truly the first to understand. Having studied thoroughly, getting a vast knowledge and receiving the approval of the Buddha in numerous occasions – he had not yet received the transmission of the true Dharma, nor had he opened and clarified the field of the mind. When Mahakashyapa was about to compile the teachings left by the Buddha, Ananda could not participate because he had not attained realization yet. Later on, Ananda practiced carefully and soon reached the state of Arhat. 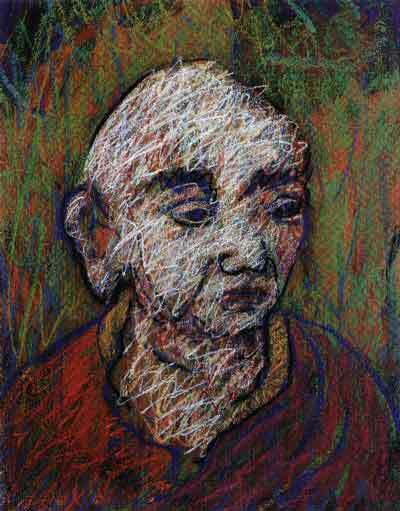 Ananda was the Buddha’s secretary, so he has heard plenty and studied a lot. He was like a glass of water poured into another glass of water with not a drop spilling. Let’s ask him to recite the teachings for us. Mahakashyapa said to Ananda: We all hope you will recite the Buddha’s teachings. Then, Ananda, who had kept the Buddha’s legacy with him and now received Mahakashyapa’s petition, started reciting all the teachings the Buddha had given in his life. Mahakashyapa asked the disciples: Is there any difference with what the Buddha taught? The disciples answered: No, there isn’t any difference. Those disciples were great Arhat, possessing the six great knowledges, including the powers of knowledge of past lives, clairvoyance and the power of the end of contamination. They had not forgotten anything of what they had heard. With one voice they said: Is the second coming of the Buddha or is it Ananda who speaks? Praising, they said: The waters of the ocean of the Buddha’s teaching have passed to Ananda. The Buddha’s teachings that have reached our times were those exposed by Ananda. So we know with certitude that the way does not depend on a great apprenticeship or the obtainment of the satori; this should be a demonstration. Ananda followed Mahakashyapa for another 20 years and obtained the great satori at the time aforementioned. Since he was born in the night of the Buddha’s Satori, Ananda had not heard discourses such as that of the Flower Ornament Sutra, but he obtained the concentration of the Buddha’s attention and could recite what he had not heard directly. The fact that he had not entered the Way of Zen is the same as our incapability to enter. In the distant past, Ananda had awakened to the aspiration to the great Satori in Buddha’s presence, called King of Vacuity, at the same time that the Shakyamuni Buddha did. Ananda was excellent in intellectual training and that was why he had not truly experimented the Satori. Shakyamuni, on the other hand, cultivated the energy, so that he did reach the Satori. A lot of intellectual training without applying oneself to the Way is like the poor man who counts other’s coins without him having a cent. If you really want to know what the Way is, do not submerge yourself in academic apprenticeships but simply be energetic in the progressive practice. Ananda still thought that something besides the Kesa had been transmitted. So he asked Mahakashyapa: Big brother, did the Buddha transmit to you anything else besides the golden Kesa? Mahakashyapa, sensing that the moment had come, said: – Ananda! Lower the flag’s mast in front of the door. Ananda had a great satori upon hearing this and the Buddha’s Kesa placed itself automatically in his head. This Kesa was the one which was correctly transmitted by the seven Buddhas of the past. There are three explanations concerning this Kesa. One is that the Tathagata was born from the maternal womb wearing it; the second one is that he received it from celestial beings; and another one is that he received it from a hunter upon quitting his palace. There are other Buddha’s Kesa.Bodhidharma’s Kesa, transmitted to Eno, the sixth Patriarch, was a cotton blue-black Kesa with blue points. These sewing points were added after the Kesa arrived to China. Nowadays it is kept at the sixth Patriarch’s temple and is considered a national treasure. In the Transcendental Wisdom treaty it is said: “The Buddha wore the clothing of an ordinary monk” and it is the same clothing. This golden Kesa was a wool Kesa with gold threads. A sutra says: “A Buddha’s aunt made a Kesa with her own hands and presented it to the Buddha”. These are some examples of Buddha’s Kesa. When we hear about super natural experiences, they tell many stories regarding the Kesa. A long time ago the Venerable Vasasita encountered difficulties in his relationship with a king. He put the Buddha’s Kesa in the fire and five colour rays appeared. When the fire was extinguished, the Buddha’s Kesa was intact and the king found the faith in what the Buddha’s Kesa was.